New York, NY – Dec. 7, 2016. The J.P. Morgan Tournament of Champions (ToC) announced today that every one of the world’s 24 top-ranking men’s and women’s players has been confirmed for the 2017 championship to be contested January 12 – 19 in Grand Central Terminal. 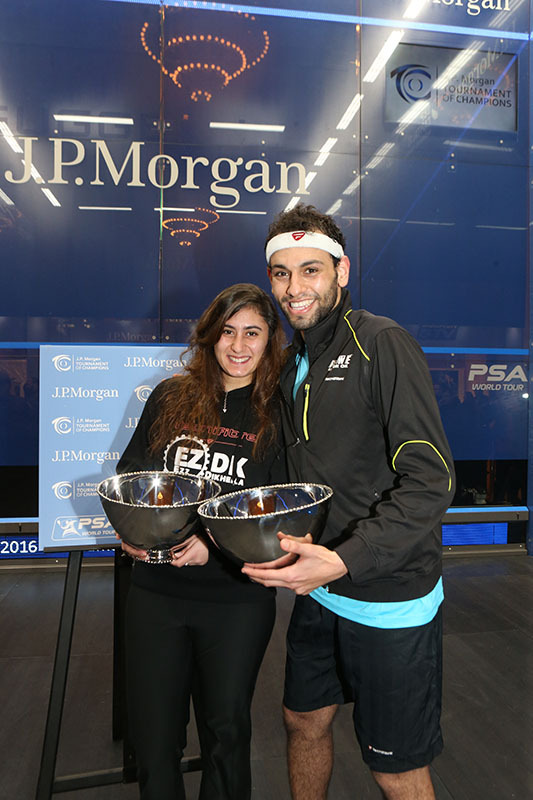 Defending champions Nour El Sherbini and Mohamed Elshorbagy, both of whom are currently ranked #1 in theworld, will face stiff competition as they attempt to retain their titles. The men’s field includes four other ToC titlists, all of whom have been ranked #1 in the world. Gregory Gaultier of France, Nick Matthew of England and Ramy Ashour of Egypt, will be the third, fourth and fifth seeds, respectively while England’s James WIllstrop continues his climb back up the rankings after being sidelined with a hip injury a year ago.. The number two seed will be Karim Abdel Gawad, who has taken the squash world by storm in the past four months, winning three of the last four tournaments he has played, including the World Championships. The four-walled glass court will be constructed in the five days prior to first round play. Fans will be able to catch the action in Grand Central from the ticketed seats in the stadium, free standing room at the front wall or on closed circuit TV screens on the west side of Vanderbilt Hall. The ToC is the only sports championship presented annually in Grand Central Terminal. In 2016, the ToC generated 704 hours of global coverage, attracting 2.2 million viewers and realizing more than $40 million in media value for its sponsors and partners. The J.P. Morgan Tournament of Champions is one of eight World Series events sanctioned by the Professional Squash Association (PSA) and one of only three to offer equal prize money and draw size for both men and women. It is the only PSA World Series event to have been staged in the same venue for two decades. Tickets range in price from $8 to $170 and are available for purchase at www.tocsquash.com.